Comm Eye Health Vol. 13 No. 34 2000 pp 26 - 27. Published online 01 June 2000. Papua New Guinea (PNG) is a land of high mountains, dense forest, lowland swamps, coral islands, torrential rainfall, many rivers and beautiful flora and fauna. There are over 1,000 people groups with more than 860 languages. Over 80% of the 4 million people live in a rural subsistence environment. Increasing literacy (approaching 50%) is the result of half a century of widespread missionary sponsored education that is now becoming nationalised. The loss of near vision by the age of 40 and the onset of cataract by the age of 50, indicates an enormous need, not only for eye care and the recognition and treatment of common eye disease and frequent ocular trauma, but also the accessibility and availability of low cost spectacles. 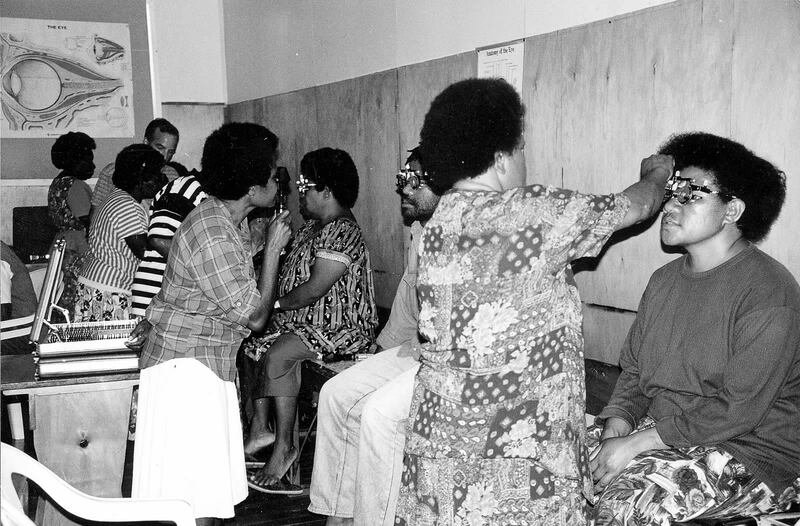 Prior to the first nurse training course conducted in late 1994, eye care in PNG had been available only from a few Government eye surgeons 3 , who were overworked and located in the major centres, or 1 private ophthalmologist and 2 private optometrists who catered mainly for the few expatriates and the small number of wealthy national people. A strategy for the development of a sustainable eye care programme, offering accessible and affordable eye care and spectacles to the people of Papua New Guinea, was initiated in 1994.
train selected nurses to take over the support and eventually the teaching of future eye care courses. A Certificate course was developed. The course aimed to train nurses in basic understanding of the eye and eye problems (both refractive and disease), with skill in the diagnosis and prescription of appropriate spectacles (emphasis on low cost, ready-made spectacles), and in recognition of eye disease and basic treatment. The course was of 10 weeks’ duration, after which the nurses returned to their own hospital positions. The teaching pro gramme was a mix of lectures and practical sessions with emphases on ‘hands-on’ experience, visual models and practical illustrations. A number of work sheets or ‘assessments’ were used to assist in monitoring progress of the trainees and highlighting areas requiring revision. The trainees were supplied with a set of eye examination equipment (including an ophthalmoscope, retinoscope, trial lens set and trial frame, letter charts, loupe, text books, etc. ), and an initial stock of low cost eyeglasses (total value about US$1,500 per trainee), which was donated to the supporting hospital or health centre. After graduation, these nurses returned to their hospital/health centre. As well as continuing their normal nursing duties, they conduct regular eye clinics to provide eye care to their communities. The patients pay the usual, nominal, outpatient fees. Spectacles, when required, are supplied at 10K (US$3), for basic plastic frames from stock held by the nurse. Metal framed spectacles are available at higher costs. Replacement stock is ordered as needed from a nationally staffed Optical Workshop established by CBM International. The nurses are effectively able to handle 80% of the eye cases that present for assistance. They also identify those patients requiring surgery, enabling maximum effectiveness from the eye surgeons’ visits. Thus, the nurses are providing accessible and affordable eye care in a sustainable system that is cost neutral to the national health budget. So far, two Certificate courses have been conducted, one in 1994 and a second course in 1997. These courses have been funded by AusAid, Lions International, CBM International and other donations. Of the 25 nurses who graduated from the 2 courses, 20 are still active in eye care. (Some of the others are only temporarily inactive in eye care work due to changes in work situations). Collectively, by the middle of 1999, they have been able to provide accessible and affordable eye care to more than 45,000 people throughout PNG. As a vital part of the programme the trainees are visited in their home hospital or health centre about six months after graduation. Rody Ukin, a nurse from the first course is being trained to take a leadership role as the National Eye Care Nurse Co-ordinator. Rody was involved as a tutor during the second training course and competently undertook the follow-up visits to the second group of nurses. He is respected and will have a significant role in the teaching of future nurse training programmes. It is hoped to train another of the nurses as a second tutor/co-ordinator. The nurses provide monthly reports, summarising the various eye conditions that presented and the numbers of patients requiring specialist attention. These monitor each nurse’s progress as well as indicating those areas in need of an ‘eye surgery’ visit. In-service training or conferences for nurses have taken place each year. These gatherings are a very valuable time of reviewing knowledge and skills and also teaching some new aspects of care. The nurses can also share their experiences and encourage one another. 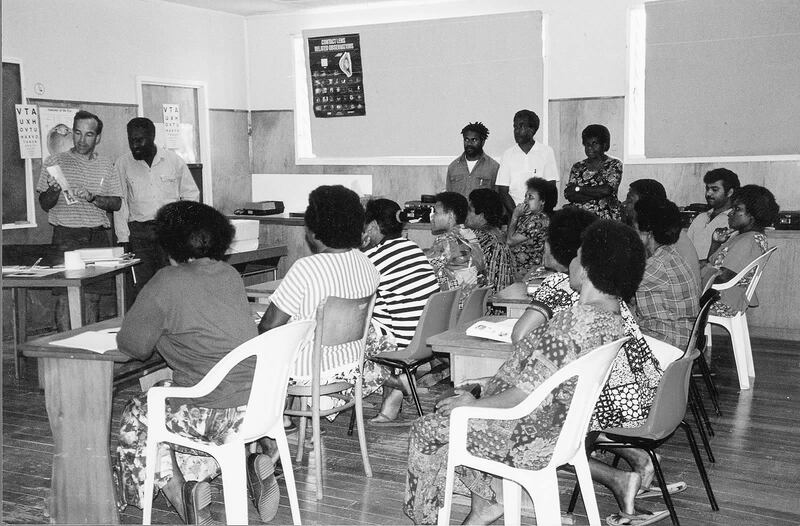 The 5th Annual Eye Care Nurses’ Conference/Refresher course, held in April 1999, marked a significant stage in the development of eye care in PNG. In 1998, the PNG Health Department appointed Dr Bage Yominao to the role of National Co-ordinator of eye care in PNG. Dr Yominao, together with Rody Ukin, organised the 5th Eye Care Nurse gathering. Most of the teaching at the 5th Conference was given by national ophthalmologists. Of the 20 active nurses, 19 attended the conference. Three ophthalmic nurses also attended the conference. Further, we had 7 (all but one) of the active Government ophthalmologists join with the nurses for the last day. Another important development in eye care in PNG is the establishment of a Diploma of Eye Care Nursing. This will be a one year course combining theory and practical components based on the experience of the existing Certificate course. It is anticipated that the main hospitals in PNG will have a specific full time position, at an appropriate salary level, for a nurse who is a graduate of the Diploma programme. While there have been some difficulties with the eye care work, the overall strategy of training nurses has proved to be remarkably effective. Most of the problems experienced by the nurses relate to 4 areas which will need to be addressed. Acceptance and recognition. Whilst the nurses are taking on significant additional responsibility and workload (including extra hours and on call work for some of them) they are still receiving only basic nursing pay. In some areas they have been recognised as competent eye care workers and are appreciated. In other places the hospital management has been less supportive. The excellent work of the eye care nurses and improving cooperation between them and the ophthalmologists will encourage recognition of the nurses as a vital part of an integrated eye care programme. The establishment of the Diploma of Eye Care Nursing will further add to the acceptance of the eye care nurses. Supply of spectacles. We are continuing to work with the Mt. Sion Optical Workshop to help improve the supply of low cost spectacles. There is also another nationally run optical workshop being established. This successful eye care programme has been adopted by the PNG Government as an official programme of the PNG Health Department. The training and function of these nurses in eye care is different in approach and content to that of ophthalmic nurses. An ophthalmic nurse is trained to support and assist an ophthalmologist in the hospital clinic and operating theatre setting. She or he also has a general nursing background. In contrast, the eye care nurses are trained to work independently, often without direct access to an ophthalmologist, and most are the only trained eye care worker in their area; some, the only eye care worker in their province! There are now a number of hospitals with an eye care nurse as well as ophthalmic nurse and this more efficient teamwork is already making a significant impact in PNG. Training and further development of capable leaders and teachers for the eye care nurses so that they can eventually teach the Certificate and Diploma courses themselves. This approach, which has been so successful in Papua New Guinea, could be used as a model for the rest of the Pacific region and where appropriate in the rural areas of other developing countries of the world. 1 Parsons G. Blindness in Papua New Guinea. PNG Medical Journal 1987; 30: 207-11. 2 Parsons G. A decade of ophthalmic statistics in Papua New Guinea. PNG Medical Journal 1991; 34: 255-61.